A whole week done already? That was fast! 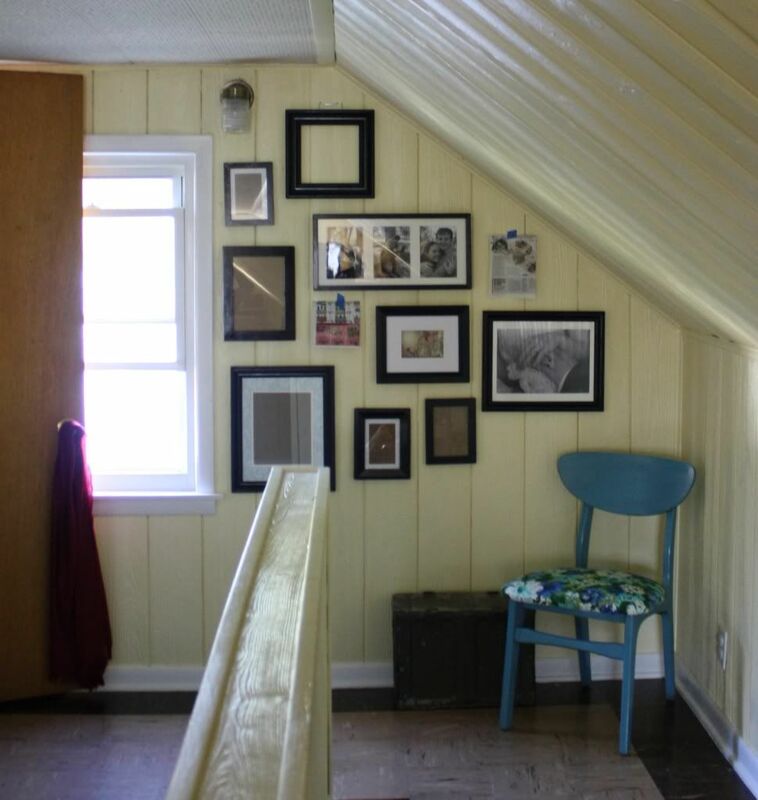 Today we'll be looking at a cheap way to bring art into your home, and I'll be dressing up the nook at the top of our stairs at the same time. Our master suite upstairs is still very much a work in progress that started when we painted all the dark wood paneling. This is the space at the top of the stairs all painted and fresh, but looking pretty empty. 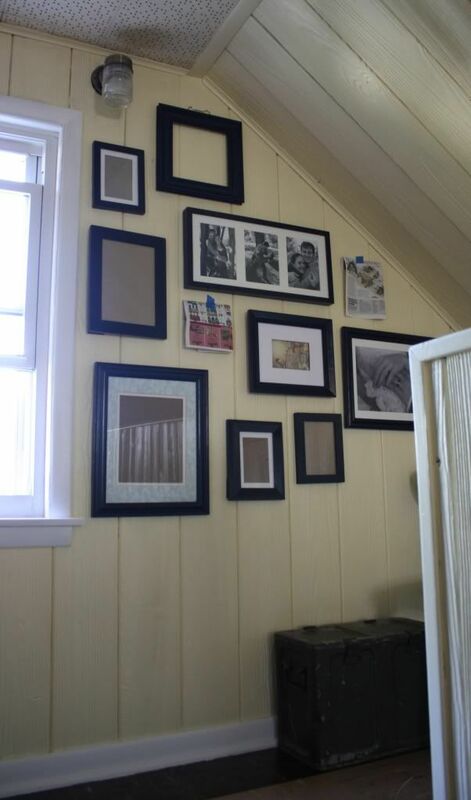 I like the contrast of those black and white pictures against the pale yellow wall, so I decided to try taking it a little further and create a photo gallery wall (See our finished gallery wall here!). I started by collecting an assortment of frames at yard sales earlier this summer. I picked frames of all shapes, sizes, and colors. This is definitely an instance where looking for potential is important. Frames can look all kinds of ugly, but a coat of spray paint can make a world of difference! Once I had enough I painted them all glossy black with spray paint. (I learned in my first gallery wall attempt that spray paint is definitely the way to go!) This time I used the cheap stuff from Lowe's and was surprised at how even the finish was, but let me tell you, it stunk to high heaven. And I feel like the paint rubs off a little, but since these won't be handled (ever) I wasn't too worried about it. 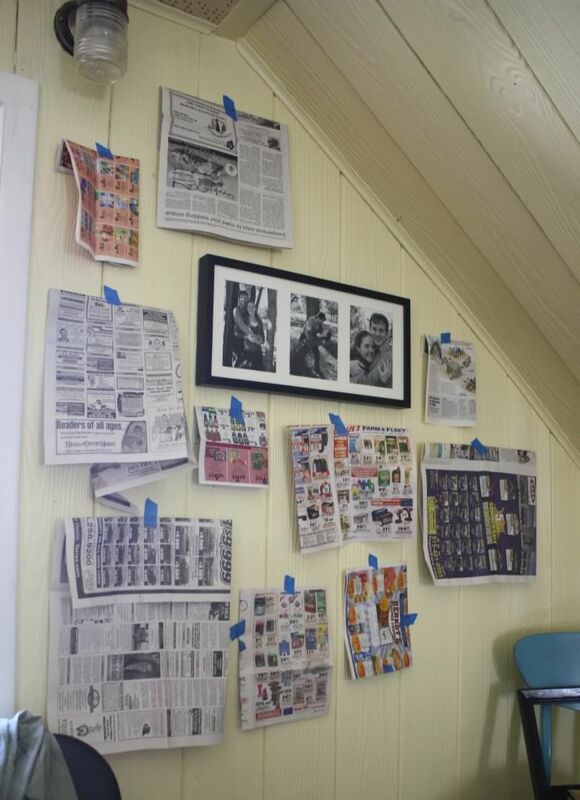 Then I mapped a layout using newspaper and put all my nails up just like I did with the gallery wall in the living room. So that was a pretty cheap way to get a whole wall of art and I love that it welcomes us upstairs, even though the rest of the room isn't finished yet. :) I ordered pictures to fill it in (and some for the downstairs gallery, finally!) So I should have a finished product to share soon! How about you? 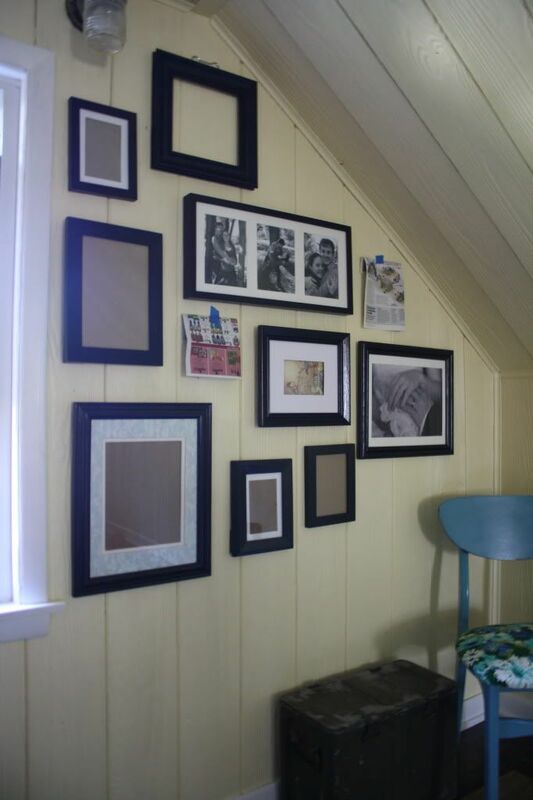 Every made a gallery wall? Or do you have another spiffy piece of art that you made on the cheap? Or maybe you made the most of an awkward space in your home? Come on, spill it. What potential have you found today? I love gallery walls! I've been working on one in our kitchen for a while and would love to finish it over the weekend. Thanks for the inspiration! I'm your newest follower. Thanks, Jen, glad to have you! I've been working on one in my living room for a while and just finally ordered pics to try to finish it up. Did you get a chance to work on yours this weekend?